Caption slip reads: "Photographer: Snow. Date: 1958-07-29. Reporter: Waymire. Assignment: Knight gets ham. 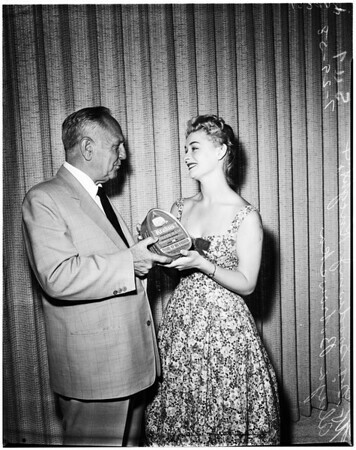 Governor Goodwin Knight receiving Polish ham as 'thank you' gift from Miss Universe Contest's Miss Poland, Alicja Bobrowska".